Discuss the prevalence of musculoskeletal disorders (MSDs) among oral health professionals. Ergonomics remains an important topic within the professions of dentistry and dental hygiene. It has been established that oral health professionals are at high risk of experiencing a physical injury while performing their normal work duties.1 In fact, dental practitioners frequently seek out remedial care to address persistent musculoskeletal disorders (MSDs), with estimates indicating that 60% to 96% of the workforce is impacted.2 Among this population, these disorders most commonly affect the neck, shoulders, wrists and hands.3,4 Despite attempts to educate and implement ergonomic-based programs, MSDs are increasingly prevalent. The day-to-day procedures provided by oral health professionals are associated with MSDs due to the physical demands inherent to the occupation. These include prolonged sitting, leaning forward to provide care, repetitive pinching and grasping, operating equipment, and routine computer work.5 In addition, many clinicians face uninterrupted work cycles, leaving dental teams with few opportunities to implement structured rest breaks. These occupational forces illustrate why establishing and maintaining a routine movement program can help reverse the effects of this rigorous work. One of the most common barriers to implementing an ergonomic-based exercise plan is a persistent lack of time. In fact, health care workers frequently neglect their own self-care in the interest of caring for others.6 Other common factors that limit performance include a lack of supervisory support, inadequate physical space, improper education, reduced self-efficacy, financial barriers, or working in a clinic culture where ergonomics is not highly valued.7–10 Whether one or more of these obstacles exist in any given workplace, individual diligence and self-advocacy are required to adequately address ergonomic concerns. With the support of Pacific University’s administration and the commitment of several dedicated students, the concept of the Core Four was developed. This is a set of four activities explicitly designed after extensive movement analysis of oral health professionals in their work environment. The program was designed to integrate the management of time, focus of a routine, and the necessary parameters for genuine tissue healing. The Core Four is not entirely comprehensive; no four activities could ever fully inhibit the onset of an MSD. Instead, these four activities seek to reverse the normal effects of routine dental work on the most impacted tissues of the body.3,4 Most significantly, these exercises should be viewed as corrective in nature for the targeted body areas, rather than as strictly preventive. Certainly, the consistent performance of these activities may directly alleviate the potential for the onset of an MSD; however, these activities primarily serve to disengage and correct the inherent stress created on clinicians’ joints, muscles and tendons in the neck, shoulders, wrists and hands. Taking breaks throughout the workday can also reduce the need for physical recovery at the end of the day, and may directly reduce the risk of MSDs.15,16 Normal breathing patterns should be maintained during each activity. Providers must be mindful of the tendency to hold their breath and avoid this response, as this type of exertion can create increased intrathoracic pressure. The stretches are a vital aspect of the program, as they seek to elongate muscles that impact pinch, grip and reach during instrument-related activities. Muscles are contractile tissues that frequently shorten as dentists perform normal tasks with their hands and wrists. After persistent, repeated contractions that shorten these muscles, it is necessary to reestablish the normal resting length of muscles so their function can be reoptimized. Research has consistently shown that muscular stretches should be held for sustained 30-second increments in order to facilitate lasting tissue elongation.17–20 The literature also shows that no additional benefit is achieved after 60 seconds. Therefore, each of the stretches specifically includes parameters that fulfill this evidence-based criteria. The two movement activities are relevant to postural correction through realignment of the natural curves of the spine. The spine has four normal curves to its anatomical shape, so “sitting up straight” is not a sensible option for the human body. Instead, individuals can develop a more keen awareness of the tendency toward postural malalignment and make intentional efforts to restore the spine’s natural curvature. This will reduce unnecessary stress on the spine. Both of the movement activities should be performed without overexertion or laborious effort, and should instead be fulfilled in a fluid, gentle and deliberate manner. In order to perform it properly, place all five fingertips together and touch the palms firmly in contact with one another, starting at chest height very near to the trunk. While maintaining close contact of the palms and fingertips, slowly lower the hands toward the waist until a mild but comfortable stretch is noted; most people will feel tension develop just above their wrist on the anterior (palm) side of their forearm. When this position does not yield a feeling of tension, the position of the hands can be maintained and the forearms can be rotated outward so the fingers point directly away from the chest; this should enhance the feeling of stretching. The second stretch of the Core Four targets the extensor muscles located on the dorsal (backside) of the wrist and forearm (Figure 2). This seeks to elongate the extensor carpi radialis longus, extensor carpi radialis brevis, and extensor carpi ulnar muscles, and is normally completed by the dominant arm used to hold instruments. 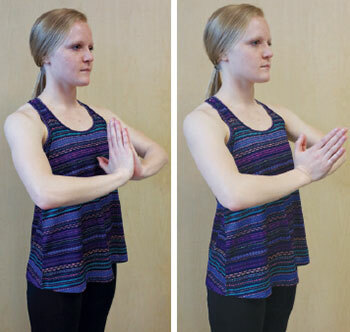 The contralateral extremity can receive a similar stretch if time allows.20 In this stretch, the elbow should be fully extended (without being locked out or hyperextended), and the wrist should be flexed downward toward the palm side of the hand. The shoulder position can vary. This exercise can be done at shoulder height or below. Obtaining a point of personal comfort is the highest determination for this aspect of the stretch. Additionally, the contralateral hand (nonstretched side) should facilitate the stretch over the metacarpalphalangeal joints (largest knuckles on the back of the hand) and not over the fingers, as including finger flexion will target undesired muscles. If performed correctly, a stretch should be felt just proximal to the wrist in the posterior forearm. When this initial position no longer yields a feeling of tension, the shoulder can be rotated inward (causing the fingers to move relatively outward) while maintaining the same position of the elbow, wrist and hand so further elongation can be achieved. FIGURE 2. The second activity in the Core Four is a stretch that targets the extensor muscles located on the dorsal (backside) of the wrist and forearm. The third activity associated with the Core Four is a movement frequently called “tracing a doorframe” (Figure 3). Instead of facilitating a stretch of muscular tissue, this movement seeks to restore the normal alignment of the thoracic spine, facilitate scapular retraction, and activate some of the body’s focal postural muscles. Normally, the thoracic spine (better known as the mid-back) is aligned in a kyphotic shape, where it curves away from the trunk to create a rounded shape. Slouching can exaggerate this curve and may cause added stress to the individual joints in this region. As dentists tend to lean forward when providing care — causing an excess of kyphosis in the thoracic spine — the initial reaching upward with both arms seeks to reverse this biomechanical shortcoming. Next, as the hands are drawn outward and downward in the shape of a doorframe, the scapulae are drawn inward and downward into a more optimal position. This collective movement activates the lower trapezius, latissimus dorsi, and rhomboid major and minor, which helps to maintain the scapulae and shoulders in their desired, natural position.21 When this activity becomes effortless and fluid, an appropriate progression includes a gentle pinching of the scapulae together at the very end of the movement to further engage the postural muscles. This should not be overexerted, or the muscles between the scapulae can become strained. FIGURE 3. The third element of the Core Four seeks to restore the normal alignment of the thoracic spine, facilitate scapular retraction, and activate some of the focal postural muscles. The final activity from the Core Four is known as a “chin tuck” movement (Figure 4). Instead of seeking to correct the thoracic spine, this element attempts to realign the cervical spine (i.e.,neck region). The cervical spine has a normal curve that is in the reverse position of the thoracic spine beneath it, rounding to create a forward sway in its natural shape. Again, with clinicians’ tendency to look downward for prolonged periods during care, this lordotic curve can be exaggerated to the point where added stress is created in the neck through the effects of gravity. This can be reduced significantly with the routine use of dental loupes. In order to perform the chin-tuck movement properly, the head should be drawn backward to reduce the curve of the neck in either a standing or upright seated position. For some, it is helpful to cue proper performance by sharing the prompt to “create a double chin” by using their head and neck to draw the chin straight back (posteriorly). This activity should create a feeling of tension in the anterior aspect of the neck where the deep neck flexors lie, but may also generate a sensation of stretch in the posterior neck from supporting muscles that have become short and tight. When this activity no longer creates adequate demand on the muscles that support alignment of the neck, the chin tuck can be performed after leaning forward slightly through the hips, while keeping the knees and back relatively straight. This position introduces supplemental resistance, as the muscles must engage against the added weight caused by moving against gravity, rather than in a relative plane where movement in upright posture occurs perpendicular to gravity’s effect. FIGURE 4. Instead of seeking to correct the thoracic spine, the fourth activity in the Core Four attempts to realign the cervical spine (i.e., neck region). Overall, a decision to perform the Core Four is not incredibly significant; rather, adopting this practice as a habitual routine poses a greater challenge. Early models of habit formation indicate that nearly six months of consistent behavioral performance is required in order for the average person to establish a pattern as a lasting routine.22 Newer models indicate similar findings.23 Not coincidentally, if dentists expect patients to overcome the barriers of habit formation in order to perform daily oral hygiene during the time between visits, clinicians should expect nothing less of themselves. Accountability is integral to the process of habit formation. Studies have demonstrated the potential advantages of performing routine activities cooperatively as a means to achieve greater adherence.24 Not surprisingly, when a colleague, peer or teammate embraces the same processes with a similarly invested commitment, the likelihood of establishing a maintained routine increases. The entire dental team could benefit from incorporating the Core Four into their daily routine, and this could easily be adopted as part of the office culture. In addition to alleviating the onset of MSDs, implementation also has the potential to increase clinicians’ job satisfaction and career longevity. Despite the multitude of factors — both intrinsic and extrinsic — that creates barriers to ergonomic adoption in the workplace, oral health professionals must uphold a genuine, self-driven effort to prevent and mitigate the impact of MSDs. The Core Four routine seeks to introduce a corrective activity that reverses the effects of tissue stress experienced by dental teams, and is designed for daily performance as part of a structured rest break regimen. As such, the collective effort to maintain ergonomics as a fundamental occupational priority will allow clinicians to avoid issues with MSDs. If normal work duties or the performance of the Core Four cause symptoms lasting longer than 72 hours, dental providers should consult with a qualified medical professional to have their condition formally evaluated. Johnson CR, Kanji Z. The impact of occupation-related musculoskeletal disorders on dental hygienists. Can J Dent Hyg. 2016;50:72–79. Kumar SP, Kumar V, Baliga M. Work-related musculoskeletal disorders among dental professionals: An evidence-based update. Indian J Dent Educ. 2012;5:5–12. Ross A. Human factors and ergonomics for the dental profession. Dent Update. 2016;43:688–690, 692–695. Whysall ZJ, Haslam RA, Haslam C. Processes, barriers, and outcomes described by ergonomics consultants in preventing work-related musculoskeletal disorders. Appl Ergon. 2004;35:343–351. Henry KD, Rosemond C, Eckert L. Effect of number of home exercises on compliance and performance in adults over 65 years of age. Phys Therapy. 1999;79:270–277. Escolar-Reina P, Medina-Mirapeix F, Gascón-Cánovas JJ, et al. How do care-provider and home exercise program characteristics affect patient adherence in chronic neck and back pain: a qualitative study. BMC Health Serv Res. 2010;10:60. Lyngcoln A. The relationship between adherence to hand therapy and short-term outcome after distal radius fracture. J Hand Therapy. 2005;18:2–8. Bandy WD, Irion JM. The effect of time on static stretch on the flexibility of the hamstring muscles. Phys Ther. 1994;74:845–850. Prochaska J, Velicer WF. The transtheoretical model of health behavior change. Am J Health Promot.1997;12:38–48. From Decisions in Dentistry. April 2019;5(4):32,35. Brian J. Wilkinson, PT, DPT, CHT, CLT, is an assistant professor and associate director of clinical education in the Pacific University School of Physical Therapy and Athletic Training in Hillsboro, Oregon. He is a certified hand therapist, specializing in conditions of the upper extremity, and is experienced in promoting the optimization of workplace ergonomics. He can be reached at brianw@pacificu.edu. Kathryn Bell, RDH, EPDH, MS, is an associate professor in the Pacific University School of Dental Hygiene Studies in Hillsboro, Oregon. She also serves as associate dean for interprofessional education. Brandy Cowen, RDH, MS, is an assistant professor in the Pacific University School of Dental Hygiene Studies in Hillsboro, Oregon. She is the dental hygiene junior clinic lead and serves on the Interprofessional Education and Practice Committee for the College of Health Professions. Amy Coplen, RDH, EPDH, MS, is an associate professor in the Pacific University School of Dental Hygiene Studies in Hillsboro, Oregon. She also serves as the director for the dental hygiene program.